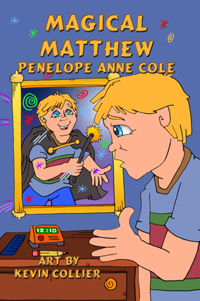 GAP FAMILY BLOG WELCOMES Penelope Anne Cole, AUTHOR OF Magical Matthew. Congratulations on the release of Magical Matthew. Please tell us more about it. Matthew has a big secret. He can fix things magically with his mind. Matthew secretly uses his magic to fix things for his family and friends. Later, he expands his magical good deeds by fixing things in his neighborhood. Matthew’s friend, Lily, suspects something is special about him. Matthew must decide whether to tell her the truth or not. Penelope: My book was inspired by my friend's son, Matthew, when he attained "double digits." I thought, “How Magical is that – he’s not a kid anymore!” Which led to, what if he really had magic? What would he do? And would he tell people, or keep it a secret?. Penelope: There are two special moments for me. First, when Matthew confides in his Grandma Nonie, showing he’s comfortable sharing his secret with a trusted adult. And, second, when he realizes he has abilities and talents beyond magic. Congratulations! We’d love to hear more about you. I’ve had a few careers: my longest was in government service Human Resources (HR), next as a teacher of adults and children, and now as a writer and book reviewer. In most of my positions, I’ve been able to write and teach others. English Literature was my undergraduate Liberal Arts major and Education my Masters program. Do you have any book signing events or book tours scheduled for Magical Matthew? Penelope: For now I’m visiting fellow author’s blogs and Magical Matthew is being reviewed. I hope to visit local schools, libraries and bookstores. How can our readers learn more about you and any upcoming Magical Matthew events? Thank you for stopping in to share Magical Matthew with us. Readers can purchase their copy here. We are proud to add it to the ever-growing line of quality titles from Guardian Angel Publishing.